Martyn Bal’s lean mean lines are very much in keeping with the defining men’s silhouette of the last decade. And, so they should be. A precocious talent, even before completing his MA at London’s Royal College of Art, Bal had undertaken an adolescent apprenticeship with Dirk Bikkembergs. Upon graduating to big applause, he was taken on by Hedi Slimane to work with on the Dior Homme collections in 2003. Since his departure from the famous Paris house, he has also designed collections for Versace and worked as menswear director for Burberry Prorsum. If his personal work history explains a certain congruence with the Dior Homme sensibility, Martyn Bal’s own collections tend to suggest that the elongated slim silhouette has less to do with Left Bank lankiness in its references and more to do with the amphetamine-driven anorexia of 1960’s pop culture energy. In his current collection, for example, there’s a strong sense of the wild and crazy days of English rock music in the late 1960’s and early 1970’s. In a special film collaboration with Markus Lehtonen profiling the collection, Swedish popster Erik Hassle plays the role of muse and model. Hassle’s music might be pretty mainstream stuff, but his very particular gangly looks heighten a certain feel to the collection, evocative of the exuberant heyday of British rock and the new kind of underfed, frenetic masculinity it advocated in reaction to the normative ideas of male attractiveness at the time. This is something that is knowingly underscored by the film’s location of Knebworth House, the British stately home with a rich rock history; the venue for legendary festival performances by The Rolling Stones, Pink Floyd, Captain Beefhart and Led Zeppelin amongst many others. The rock ‘n roll romanticism in the work of Dutch designer Bal is notable as is working with iconography that seems to be drawn largely from British pop culture movements. This latter aspect is even more directly pronounced in the AW10 connection in which the Rockabilly, Teddy Boy and punk feeling comes through strong. 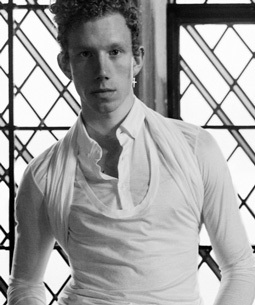 Even the male face of the collection, model Sid Ellisdon, has a name with rich British street lore connotations.